Review this sample for the Coalition for Visionary Resources Award COVR. My Eye Mag is a fabulous way to get your Irigenics reading in a 36-page, digital custom report that you can return to again and again. Discover your inherent talents, gifts, repeat patterns and ancestral imprints; as well as the basics gifts of your social style and energy dynamics. 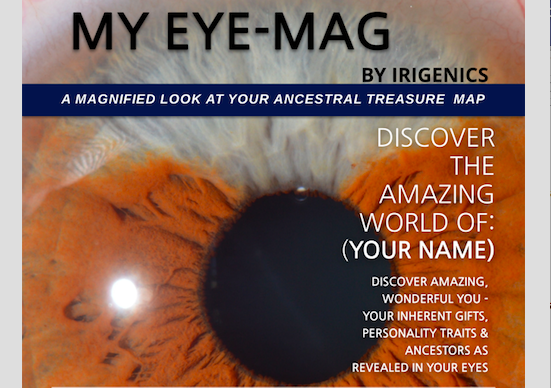 My Eye Mag is an empowering tool for how to use your ancestral gifts to your best advantage. It’s perfect for anyone who wants to understand the person they were born to be and the vibrant life they were meant to live in a format you can share with others. While My Eye-Mag Report gives you a wonderful 36-page digital custom report of the nuances of you, it does not give you the opportunity to ask questions during the reading. For that reason, there are two options available for follow-up information during the first 30 days after you receive your My Eye-Mag report. 1) 20-Minute Mini-me virtual eye reading where you will book a time to ask any specific questions you have from your My Eye-Mag digital report. 2) Discounted Eye-Time one-hour virtual reading where we will go thru the ancestral markings in your eyes, the dynamics of your life and how ancestral patterns and other indicators may be playing out. Sometimes people shift from their inherent personality and skills to meet their home environment. During the first six years of life, children operate primarily on theta brainwave and so they are very responsive to their personal environment and interactions. As they shift from their natural-inherent personality to one that was in response to their home environment, it can cause drama later in life, as it takes a lot of energy to be what you are not. Imagine the artist who becomes an accountant because “that’s a real job” whereas, “artistry is just for fun”. As decisions are made to be practical, and do what makes sense (to someone else), rather than following a natural-born skillset, mental imprints can be made to support “doing what I love won’t support me economically”. Examples can also include an introvert living as an extrovert or someone who is naturally creative becoming very analytical. Please note that Irigenics is not in any way, shape, or form a method of evaluating health. If you have a medical condition, please seek appropriate medical attention. Did you ever wonder about that brown spot in your eye? Or maybe your eye colors are always changing. Get a glimpse of the inner-makings of you and what your eyes reveal. Get up close and personal with your ancestors and some of their challenges and experiences. Understand how their experiences of something like “identity theft “at Ellis Island could be playing out in your life in the 21st century. So you’ve been told you are good at computers or writing. Now what? If you really want to understand a career path that is a perfect fit for your inherent talents and individual skill-set, an Irigenics eye reading will unfold the rest of your story. Weaving together the skills of your ancestors in the 21st century, together with your personal social imprint, choose a lifestyle rather than just a job. How can it be that you are so utterly different from your siblings when you have the same parents? How is it that you haven’t found your soul mate? Why is it that nobody ever seems to listen to you?! The second tier of your iris reveals a world of information about the world you live in. Learn your best choices for relationships and how to manage the people who are a challenge for you. Give your teenager the gift of a lifetime. A Mini-Me reading for a teenager can help them steer to a best-career from their first career. Kids readings are all about their gifts, how to use their best abilities and personality features. There is also a lot of discussion about personal energy, how to protect it, and how to recognize when they are picking up thoughts and patterns from kids around them.